This ‘recipe’ is a great example of how it’s often the most simple things that work well. There’s relatively few ingredients here, but the results are pretty special and it’s the perfect recipe to share amongst friends and family. Use good quality ingredients like palm-oil-free organic peanut butter and high percentage dark chocolate, and you’ll have a delicious treat that is also – almost unbelievably – really nutritious too. Serve these straight from the fridge for the best almost ice-cream-like taste. Lots of peanut butter. Just make sure you have a jar which is at least half full, and you’ll be able to stuff the dates with the contents. I used Meridian Organics palm-oil-free peanut butter. 1 tbsp honey (if you’re vegan, use maple syrup. You could also use ½ tbsp. honey and ½ tbsp. maple syrup for a different taste). Scoop a small amount into each date, and then squeeze the two halves of the date back together. Half-fill a saucepan with boiling water, and leave to simmer on a low heat. Place the bowl over the saucepan, so that the chocolate doesn’t come into direct contact with the heat. You can use also a ban-marie if you have one…. Stir the chocolate as it melts, ensuring nothing bubbles or boils! Once completely melted, turn the heat off and take the dates out of the fridge. 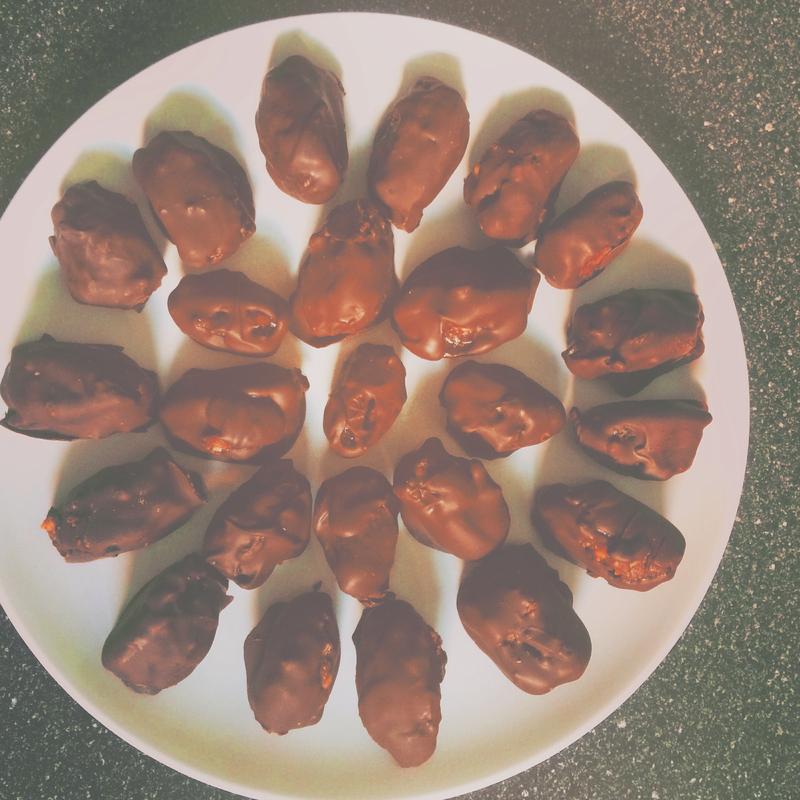 Do this 25-30 more times, resisting the urge to eat the melted chocolate as you do so…. Place the dates in a box and keep in the fridge over night to set. The next morning you’ll have an array of healthy treats which taste a lot like one of those ‘ice cream bars with caramel and peanuts, packed inside a crunchy chocolate shell’ … that you can buy from the freezer section in most supermarkets … if you know what I mean 😉 Although these are about 100 times healthier…. Stuff the dates with the usual ingredients, and add a hot chilli and some cayenne pepper inside one or two of them! Place the dates in a circle, and start a game of ‘russian roulette’; with them. What to do with the left over chocolate …… there is some left isn’t there?! You may well have some melted dark chocolate left over in the bowl. I threw in a handful of cashews, pumpkin seeds and dried mulberries – mix until well coated. Pour into a Tupperware box lined with baking paper and leave in the fridge overnight to set – now you have your own fruit and nut chocolate bar!